This Place of Worship was founded in 1933, and we understand it is still open. 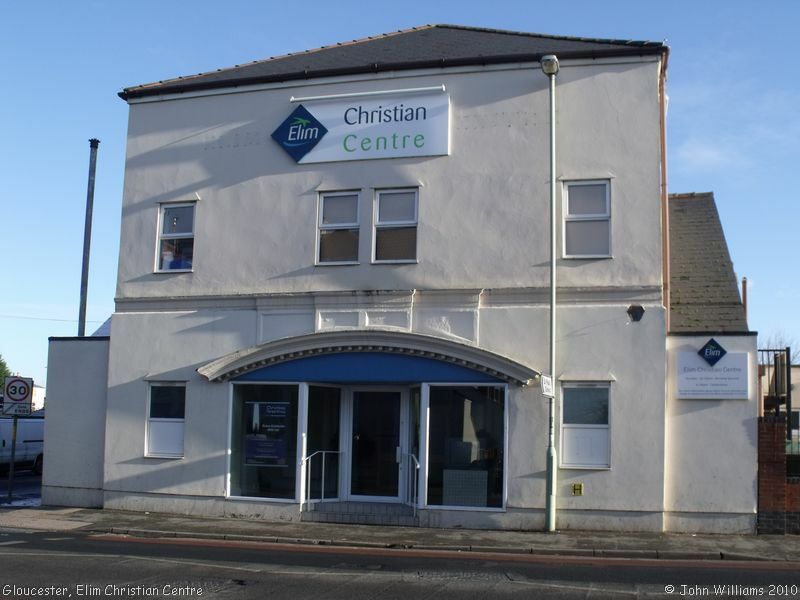 This is Elim Christian Centre (formerly known as The Elim Church) in Parkend Road. It is the third building the Church has occupied in Gloucester. When it was first set up, it was then part of 'The Foursquare Gospel Alliance', and the first building it occupied was in Millbrook Street. This building was damaged during World War II by bombing, intended for the nearby railway. When the bombs fell, a women's group was using the building, and the Pastor of the day is said to have held up some of the masonry to allow the women to get out of the building safely. It was not totally destroyed and continued in use to some extent. After the war a new church building was built on land adjacent to the damaged one. This was in use until the congregation became too large for it in about 1959/60, and at that point, the Church bought the building which is currently in use. It was formerly The Empire Cinema and for many years retained the existing cinema seating inside and the cinema's upper balcony for use during services. Sources used in compiling this account include John Williams, and Gloucester Elim Church website; and for foundation date, the Victoria County History series: A History of the County of Gloucester, Volume 4: The City of Gloucester (1988), pp.292-335 (Churches and Chapels). Now or formerly Elim Foursquare Gospel Alliance. Elim Christian Centre, Gloucester shown on a Google Map. I have found many websites of use whilst compiling the information for this database. Here are some which deserve mention as being of special interest for Gloucester, and perhaps to Local History and Places of Worship as a whole. You may want to visit Gloucester Elim Church website for present-day information. Information last updated on 29 Nov 2018 at 07:23. Please also remember that whilst the above account may suggest that Elim Christian Centre remains open and accessible, this may not remain so. This Report was created 31 Mar 2019 - 17:06:15 BST from information held in the Gloucestershire section of the Places of Worship Database. This was last updated on 7 Feb 2019 at 07:45.